From the Kitchen: Black Bean Soup | Stahancyk, Kent & Hook P.C. 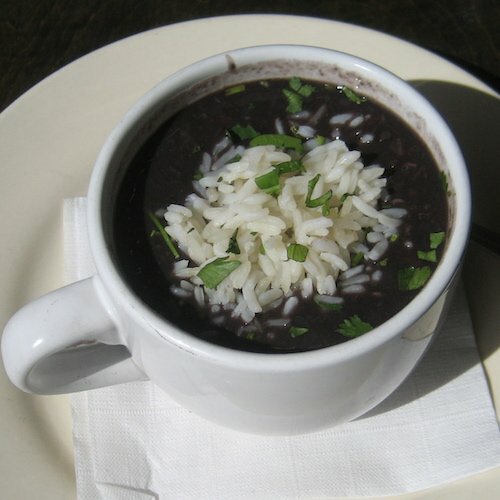 Black bean soup is a common staple in many households, but it can be a varied and intriguing dish with unique flavors and textures. Put the beans, water and bay leaf in a large saucepan and bring to a boil. Set aside, covered, for 1 hour. Return the beans to a boil, lower the heat to a simmer, cook uncovered, for 1 and a half hours. Heat the oil in a medium skillet over medium–high heat. Add the onion, peppers and tomato and cook, stirring, until soft, about 5 minutes. Add the garlic, cumin, oregano, and coriander and cook, stirring, until fragrant, about 1 minute more. Add the onion mixture to the beans and continue simmering until the beans are very tender and the liquid has thickened, about 1 and a half hours more. If the beans seem too thick, adjust the consistency with a little bit of water. Stir in vinegar, season with the salt, cayenne, and pepper to taste. Serve with yellow rice if desired. Add the tortilla chips in right before or after serving, so they stay crisp longer.